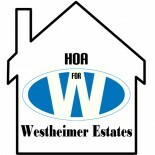 Copyright Statement | Homeowners Association for Westheimer Estates, Inc. If you believe that any content appearing on the Westheimer Estates network infringes on your copyright, please let us know. E-Mail info@westheimerestates.org the following information and the infringing material will be removed or linked to your website as soon as possible.